Since I reviewed the Monkees box set to wrap up my Record Store Day reviews, I figured I would try to get some of these other box sets that I have written up. 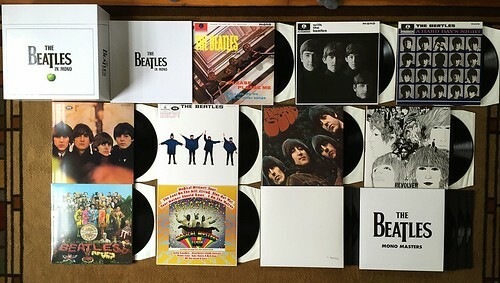 I have been sitting on this Beatles In Mono set for over a year after picking it up as a part of a very nice sale. Even attempting to review Beatles records with all of these years of hindsight is a daunting thought and I don't feel like I could ever really do any of these albums justice. Trying to describe records that are all such insane classics is borderline ridiculous, so I will mostly stick to writing about the box set itself. And as far as the box set itself goes, I can't think of a better presentation than they came up with for this guy. Each album is presented in its original mono version on 180g vinyl. Each album's original artwork is faithfully recreated to the most absurdly small detail it's crazy. The box itself is a hefty, sturdy and elegant in its design. They even had the foresight of leaving extra room for the two Beatles albums not included in this set. Though that is my one beef with this. I had to buy Let It Be and Abbey Road separate because these two records were never released in mono. I guess if you go with the theory that they're already in the Beatles In Stereo box set and why put them in the Mono set as well, that almost makes sense. But are people really buying both of these sets? I would figure most would purchase one or the other. Regardless, at least they left room in the box to add them. Also included is a nice hardcover book that is a fascinating read with lots of good recording information and other historical tidbits. The records themselves all sound amazing. Off the charts amazing. In ways that I can't even describe. This is some of the nicest sounding vinyl I own and all of these songs just jump out of the speakers in ways I've never heard before. All of the records, except for Magical Mystery Tour, are the UK versions with the UK track listings and I really feel like this set should just be issued to you if you have a record player and you listen to guitar focused rock music. It should just be mandatory. I grew up listening to The Beatles. They were my dad's favorite band and were pretty high on my mom's list as well. They also happened to write some pretty incredible songs. This box set is absolutely the best way possible to listen to these iconic records. Even if you don't want to shell out the money for this entire set, at least go buy the mono version of Rubber Soul. It's pretty much one of the most perfect albums ever written. This is where my insanity kind of kicks in-I bought the two CD sets (which is what I listen to), and when presented with deals on the vinyl sets, I purchased both, but both remain sealed. My stereo is modest, so while I think I hear a "warmth" with vinyl that is missing from the CD, I never am sure if that's because I have heard such things for so long. Having grown up on vinyl, CD's are just too darn convenient, so they remain the format I tend to buy first.